Join this 8-day Island Hopper surf camp in Java, Bali, and Nusa Lembongan Island! This is a true adventure for absolute beginner surfers to the legends on the waves. You will travel both overland and on boats between white sandy beach islands, surf in tropical paradises, meet amazing people, immerse yourself in the surf culture, and experience incredible waves to suit any ability. Come find your mojo and progress your surfing on this mind-blowing adventure! You will be staying in a shared dorm at Mojosurf Camp in Red Island for 4 nights. The rest of the nights will be spent in Canggu, and Nusa Lembongan, Indonesia. All pick-ups are done by 07:00 - 07:30 from Kuta or Legian or Seminyak area. Then, you will meet at the Mojosurf hub by 08:00. You will get to have your first surf lesson and introduction to surfing in Indonesia with the Mojosurf's team. After lunch, you start your journey to the island of Java, then transfer to Red Island. You will spend the next 4 nights in the Mojosurf Camp at Red Island which is surrounded by jungle right by a beautiful remote beach. You're up early for breakfast, surfing, more eating, chilling, and checking out this beautiful secret surf location. Enjoy a beverage while watching the amazing sunset and have a fun night with the Red Island crew. You will surf, eat, explore, surf, chillax, eat, laugh, and sleep. Optional G-Land day trip, local village tour, and paradise beach or just hang around Red Island and surf morning, noon, and arvo on the playful fun waves of this area. Early breakfast and surf then transfer back to Bali. You arrive back in Canggu around sunset for dinner and drinks. Transport can vary between a flight, boat, or minivan depending on availability and conditions. Early breakfast, surf, lunch, and transfer on the fast boat to one of the most pristine surf and dive islands in the world, Nusa Lembongan. You will be up early to explore some great surf breaks, enjoy a manta ray snorkel or snorkel safari, and continue living the ultimate lifestyle. The opportunity to try stand-up paddleboarding and other great water activities are available here on Nusa Lembongan. You will spend most of the day by enjoying everything Nusa Lembongan has to offer. Surf, eat, swim, explore, eat, chillax, and then get on a fast boat back to Bali. You arrive back in Bali around sunset for drinks, new friends, lifetime memories, and ready to celebrate an awesome Mojosurf adventure. This surfing trip will take in Bali, Java, and Nusa Lembongan, Indonesia. 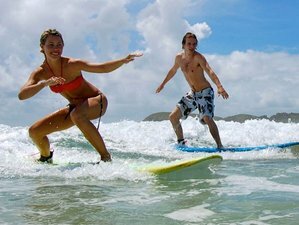 Mojosurf is a world renown Australian surf tour company that offers surf camps, surf schools, and surf adventures in Australia, Bali, Lombok, and Java.